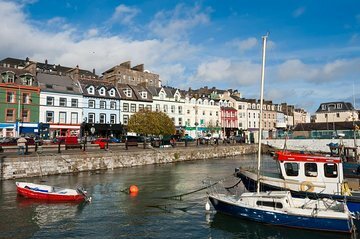 Melhore a sua experiência da deslumbrante paisagem costeira da Irlanda numa viagem descontraída de 2 dias a Cork e ao Ring of Kerry de Dublin. Viaje pela bela paisagem campestre da Irlanda e visite atrações icônicas como o Castelo de Blarney, que abriga a famosa Pedra de Blarney e a belíssima Baía de Dingle. Desfrute de uma estadia nocturna na cidade de Killarney; revitalizar com um completo café da manhã irlandês; e aprenda sobre a rica cultura e história da região a partir de um guia profissional. This two day tour was definitely NOT worth the price. The B and B they picked for us was two-star at best. Musty odor in room, long walk to town. We discovered that nicer and more convenient B and B's were available but the Ireland-based tour operator obviously wanted to save money! When I complained about the room, our host, was no help at all. Just told us to take it up with management. But he stayed at a 4-star Hotel in town center. Also, some stops were just a waste of time, such as an hour-long stop at a local cemetery! Who wants to visit a cemetery on vacation?. And tour of Cork was a joke--amounted to a quick drive-by of town, not even in town center! Finally, restaurant stops were rushed and food/selection was mediocre at best. Would definitely not recommend this particular tour! For my first time in Ireland I spent a decent amount of time in Dublin and then went on this tour. Must say, the two day tour was probably the best money spent in a while. Norman is an amazing guy and probably knows the name of every person in the country...at the least they probably know him. Tim and Kevin the bus operators were also great...and most importantly kept us safe on the twisty roads of the Ring. Looking forward to my return trip!!! Really enjoyed the trip. Day 1 was the best. Day 2 was a bit tiring. You were on the bus all day with a few rest stops, but they were so short all you could get done was use the bathroom. I would have liked a bit of time to at least be able to buy a souvenir. I can't say enough about this trip. We actually extended our tour and included Cliffs of Moher because we were having such a great time. Jonathan, our guide, is a true Irish gem and should be lauded. What a treasure trove of Irish history, and funny too! I would go with him anywhere! The history and natural beauty of Ireland is not to be missed. Norman was a wealth of know and his enthusiasm for trains was evident. I was able to add an addition day to see the Cliffs of Moher. Wish I could have stayed another day to go to the Aran Islands. Rail tours are well designed and fun to use the trains instead of the couch the whole time. Thanks NORMAN!!!! It was a very interesting trip. A lot of the scenery reminded me of New Zealand. The staff worked hard to make it enjoyable. a very well professionally run tour of an amazingly beautiful county, Ireland. The people are lovely and caring. Highly recommended tour. The rail tour was amazing and gave us a better look at what Ireland has to offer. At first, we were unsure of where the meeting place would be, but the information emailed to us was detailed enough that we were able to find our tour group easily at the Dublin Heuston Station. We didn't realize until half way of the tour that we were all mixed together for example, groups that booked a one-day tour but included parts of Cork would be with a multi-day tour that included Cork, Blarney, etc. So it is important to pay attention to who your guide is. Bob, our tour guide, was amazing. He is so knowledgable about each town, places to eat, and where to go next time you visit. He is much older so certain movies he may mention, may not ring a bell with younger customers. The B and B we stayed at was over the top. To me, it wasn't your typical B and B, it was a 4-star hotel, the Internation Hotel. I had an awesome view of the streets, which was a change. The complimentary full Irish breakfast was great too. The information given to you also didn't state this, but you really don't need to pack little snacks like a sandwich, except for a water bottle. On day 1, we had lunch at the Woollen Mall Center and dinner we ventured out and found a really good place for Thai food. On our last day, we had a complimentary breakfast and for lunch we stopped at The Ring of Kerry Restaurant. Overall, I'd do it again. I'd go back to the Blarney Castle. It was beautiful. But either way, Ireland has so much to offer that I only made a small dent. Amazing!! The best 2 days spent in Ireland. John, the guide, makes the trip worth while. He is one of the most enthusiastic and knowledgeable people you will ever meet in this kind of activity. The Cork and Blarney Castle portions of the trip are definitely 5 star. As for the second day, if you experience inclement weather, which always looms as a possibility in Ireland, you might find the second day around Kerrry a bit long, even though the scenery is beautiful and the bust makes some pretty interesting stops.